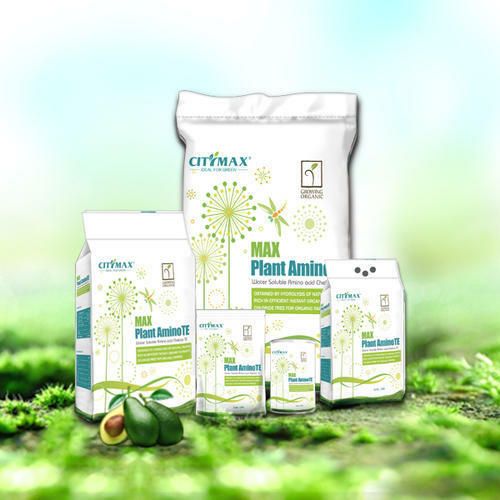 Our product range includes a wide range of max plantaminote organic fertilizers, max seasailer (ascophyllum nodosum) organic fertilizers, max uniquehumate100 organic fertilizers and ultra humimax organic fertilizers. 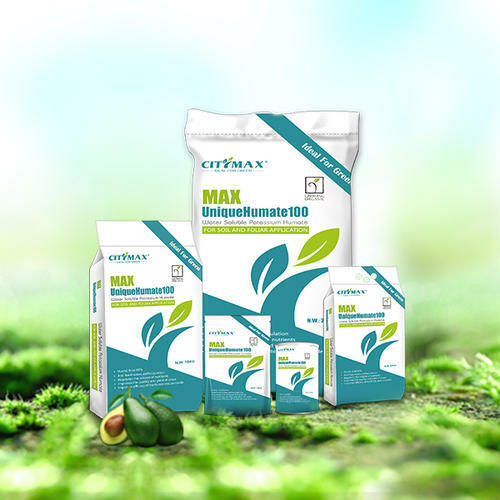 MAX PlantAminoTE is a plant based product, chelated with micro elements of Fe, Cu, B, Zn, Mn, which is totally soluble in water. The amino acid exists as the smallest protein molecules in the fertilizer, easily absorbed by the crops, increase the stress tolerance of crops. MAX PlantAminoTE is mainly used in agricultural crops, fruit trees, landscaping, gardening, pastures, grains and horticultural crops, etc. We recommended applying 3-4 times every season according to the crop season. Promote the growth of plant roots, enlarge the leaf area. Absorbs quickly, promotes early crop maturity, shortens the growth cycle. No residue, improves the physical and chemical properties of the soil. Improves water retention, fertility and permeability of soil. Increase the resilience strengths, like drought resistance, cold resistance, waterlogging resistance, disease resistance, etc. Speed up tillering process, make the stalk thicker. Stimulates and regulates the rapid growth of plants. Increase the fruits sugar content, setting rate, output and improve the crops quality. Promotes the absorption of nutrients of plants. 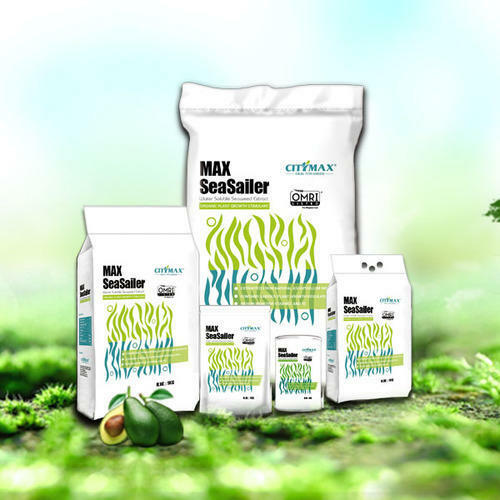 MAX Seasailer is derived from natural Ascophyllum Nodosum.This product is totally soluble in water, has obvious positive effects on crops and helps reduce the risk of disease. MAX Seasailer is mainly used in agricultural crops, fruit trees, landscaping, gardening, pastures, grains and horticultural crops, etc. Foliar Spray: Dilution rate with water 1:1500-3000 and apply 3-4 times at intervals of 7-15 days during the growing season. Irrigation: Dilution rate with water 1:800-1500, 2-3 times at middle period, at intervals of 10-15 days. Enhances yield and quality of crops, vegetables and fruits. Resists disease and improves yield. Contains plant growth regulators like gibberellic acid. Stimulates root growth in cuttings and transplants. Increases fertilizer efficiency and fertilizer chelation. Promotes cell division and increases metabolism. Promotes the bud to bloom. Inhabits harmful pests and alleviates pest damage. Accelerates the formation of soil aggregate structure to ensure that the soil has good ventilation. Max UniqueHumate100 is a type of Potassium Humate derived from Leonardite. The content is extremely high in humic and Fulvic Acid and with the highest water solubility in both flake and powder form. MAX UniqueHumate100 is a mainly used in agricultural crops, fruit trees, landscaping, gardening, pastures, grains and horticultural crops, etc. Foliar Application: 5-8kg/ha with the dilution rate 1:600-800. Slows decomposition to increase the release of potassium. Promotes crop resistance to drought and disease. Enhances water holding capacity of soil. Reduces soil erosion and improves workability of soil. Regulates the release of nutrients. Improves the quality of agricultural crops. Improves the efficiency of fertilizer. Improves the yield of crops. 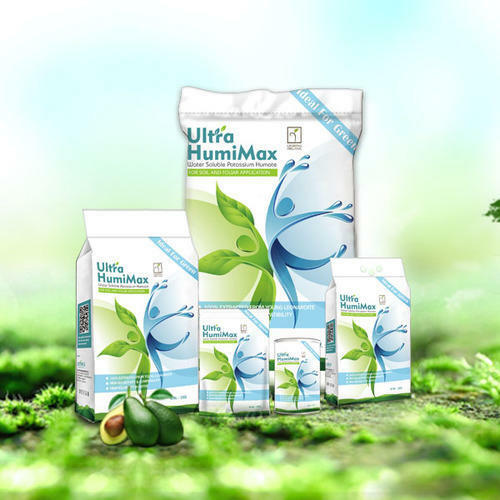 Ultra HumiMax is a type of Humate organic fertilizer, and can be used for foliar and soil application. It has the necessary nutrients to improve crop quality and yield in both flake and powder form. Ultra HumiMax is mainly used in agricultural crops, fruit trees, landscaping, gardening, pastures, grains and horticultural crops. Increases organic matter of soil. Improves crop respiration and photosynthesis. Improves the content of available K.